Lookie ma! I’m on your arm, and I’m not freaking out!!! Loretta’s been playing hard to get. Every time I reach in to pick her up, she runs screaming. Once I have her securely in my hands, she frantically wiggles her wings free and beats them until I put her down. I was convinced she hated me. I managed to pick her up, then allowed her to steady herself on my arm. She took to the new perch, and settled. 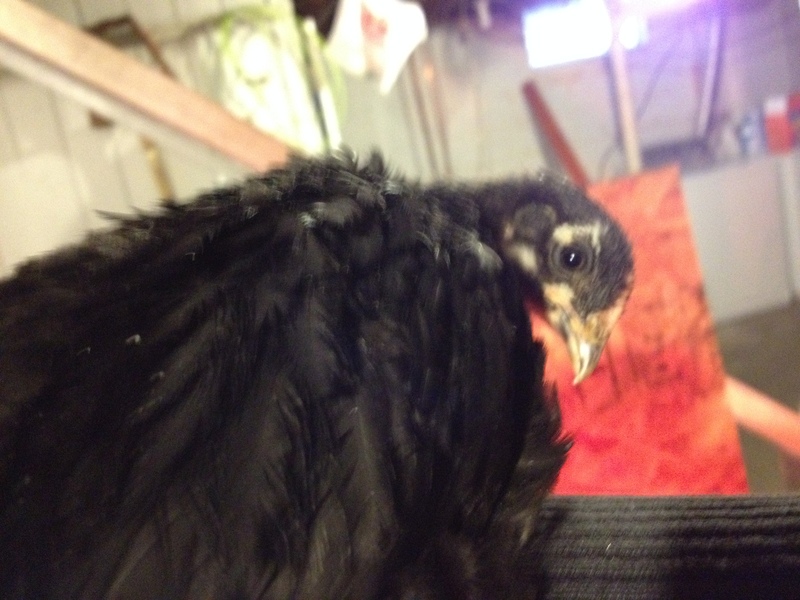 I softly ran my fingers over her back feathers and her tail. Amazingly, she let me. 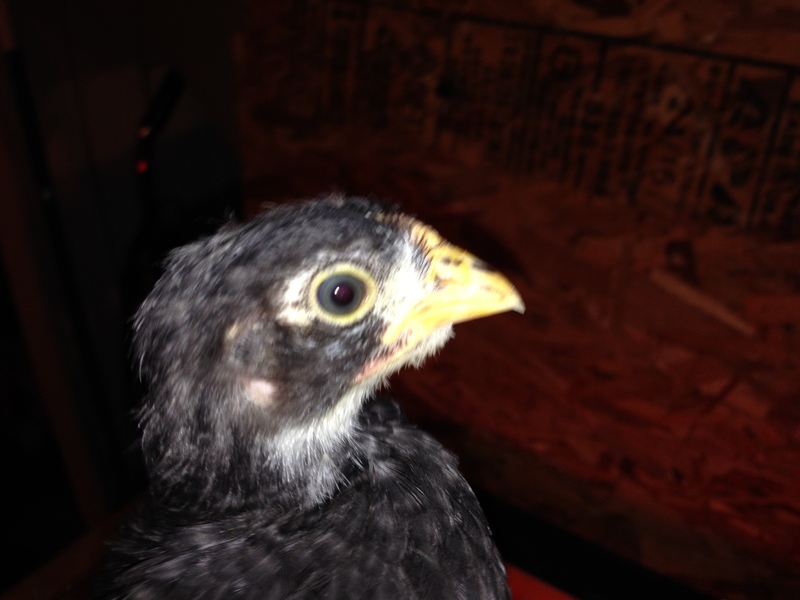 After a few minutes of this, I gently placed her back in the brooder. Then the unthinkable happened. She let me pet her. I rubbed her chest, and smoothed her black feathers. Is her wall beginning to crumble? You can see a small bald patch below Nellie’s ear. All three chicks have matching spots. When I got home tonight, I noticed a bare spot beneath Gigi’s ear. I checked, and she had a matching spot on the other side, as well. One by one, I looked at each bird, and they all had these small patches beneath their ears. I saw no blood, so I didn’t think they were caused by pecking. And since they all had them, it had to be normal, right? So I went to BackYardChickens.com, and found nothing in a search. I tried Google. Nothing but balding babies. Then I decided to start my own thread on BYC. After explaining the situation, and posting a photo of Nellie, I got a quick response. And with that, this mama hen promises to stop worrying.